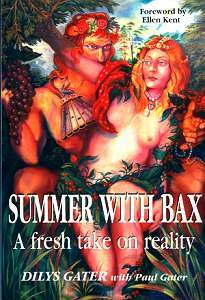 SUMMER WITH BAX: A fresh take on reality. By Dilys Gater with Paul Gater. How you react to this slim volume will naturally be coloured by your attitude to after-death communication. Dilys Gater is a well-known medium. My first acquaintance with her writings came through a book called, �A Psychic�s Casebook�, pretty much a day-by-day account of what a medium does and, indeed, has to cope with. Arnold Bax, of course, died in 1953. Gater�s method of communication, we are told almost immediately, is via trance - a state wherein the medium puts his/her consciousness to one side, giving the visitor freedom to communicate directly to living people. Trance is certainly something one needs to see in action � put like this is sounds pretty unbelievable. But I have seen it � at the College of Psychic Studies in South Kensington � and it was an impressive event. Gater is not a direct voice medium, in that the voice of Bax did not come though her. In the taped sessions her voice remained her own. Yet she calls upon clairvoyance - describing images Bax gives her - presumably before she starts channeling fully � comments like �he�s showing me ��, as Bax drops an image into her mind, appear regularly. The volume is interspersed with atmospheric black-and-white photographs, plus several inspirational poems (including the mystic poets William Blake and Edward Fitzgerald). Paul Gater contributes several chapters that give background for the reader: �A brief introduction to Bax�; �Bax and Women�; �Bax � The Hidden Man� and a final 3� page, �A Short Musical Appreciation of Sir Arnold Bax�, which includes some discographical reference. But it is the conversations that provide most interest. Bax comes across as a man of intelligence, warmth and possessed of a real urge to communicate. There is a Buddhist-like emphasis on the now, sometimes - describing a nature scene, he says, �It�s enough that it�s there. The being of it is all that matters�. He speaks candidly of his depression, and of his perceived need to hide it � �On the surface I was a � "Laugh a minute" � There are parts of one�s life or one�s existence � where no-one sees and you don�t want them to see�. He examines his fascination with the sea. Of his own music, he says, �I was a craftsman. I was not an inspirational, elevated conveyor of abstruse philosophy through musical notes�. Candid, certainly. There are inevitable questions, prime amongst which must surely be what is music life �on the other side�? The answer � �All music is the same. Don�t ask me about the Music of the Spheres, because you might as well be asking me about the Dance of the Comedians�. Describing his own musical activities when he was alive, he says that, �If you don�t reach the boundaries or you don�t try to cross them, you never get that sense of great power that is kept in check�. How true. Personally, I can�t hear this too much in his music - I�m pretty much weaned on Boulez and Stockhausen when it comes to twentieth-century music - but the sense of adventure is certainly there for all to hear, the sense of an individual searching for his own path. Bax�s views on critics are pretty dismissive (pp.70-72). Perhaps the comment, �only the ones who play � the true musicians � are there on the edge�. Fair play, but someone has to do it! He�s not too keen on conductors, either: �They are blind sometimes, leading the sightless�. But perhaps the best quote comes from Bax on the subject of his own passing over. �The trouble with dying is that you become dismissed as dead�. Indeed. And it is good that Bax has been granted the right of reply. This is not the first book of its sort, but it seems to be the first by a major composer. If the concept appeals, readers may be interested in Paul Beards� �The Barbanell Report� (ISBN 0946259232) in which Maurice Barbanell reveals his impressions and experiences post-mortem via medium Marie Cherrie.